The world faces difficult problems: violent extremism, the impact of global migration, income inequality, and climate change, to name a few. But it’s important to remember that these “wicked problems” are made up of a host of interconnected forces that work together. They can precipitate and perpetuate the issue at hand. Take local crime, for instance. The problem is more than just people who commit unlawful acts. It’s about the entire network of forces that fuel crime – factors like unemployment, a lack of education, high incarceration and recidivism rates, poverty, and access to guns. When we see problems as intricate systems, we can start to connect the various facets that comprise them. Enter systems thinking. Systems thinking explores and tries to explain complex problems, which are often exacerbated by uncertainty and rapid change. Systems thinking is a mechanism for seeing a system as a set of forces, connections, and evolutionary properties that make up the whole. It has garnered attention from nonprofit organizations, community advocates, and policymakers as an innovative way to approach complex issues like international migration, conflict management, income inequality and more. We’ve pulled together a collection of resources that explore the core concepts of systems thinking. How can journalists apply systems thinking? Let’s revisit the example of local crime. The news will tell you what happened: a homicide was committed, adding to a growing list of murders so far this year. Of course, the story is bigger than that. The trouble with this approach is not the individual story, but the fact that isolated news dispatches themselves may not adequately connect the various forces that led to that particular crime. Readers don’t come away with a complete picture of how any of the working parts relate to one another. Think of it like an iceberg. The tip of the iceberg is the event – a homicide occurred, a family was evicted – it’s what we can see above the water. But below the surface lies much more, driving the event that we witness. Below lie patterns and trends, underlying structures, mental models, and the assumptions and generalizations that determine how individuals see the world. What would a story look like if it addressed these trends over time? If it factored in the underlying connections between other events or the beliefs and assumptions that drove the event itself? 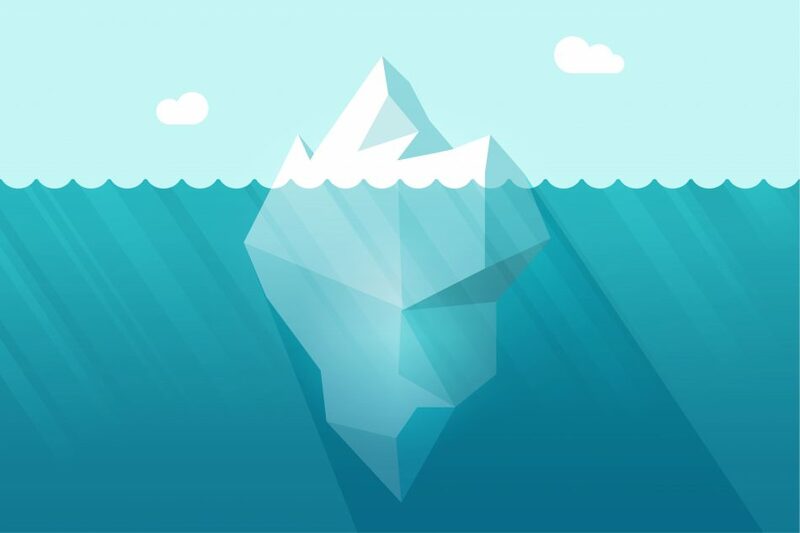 If communities are only given information about the tip of the iceberg, they risk being unable to understand the deeper, larger mass that is obscured beneath the surface. 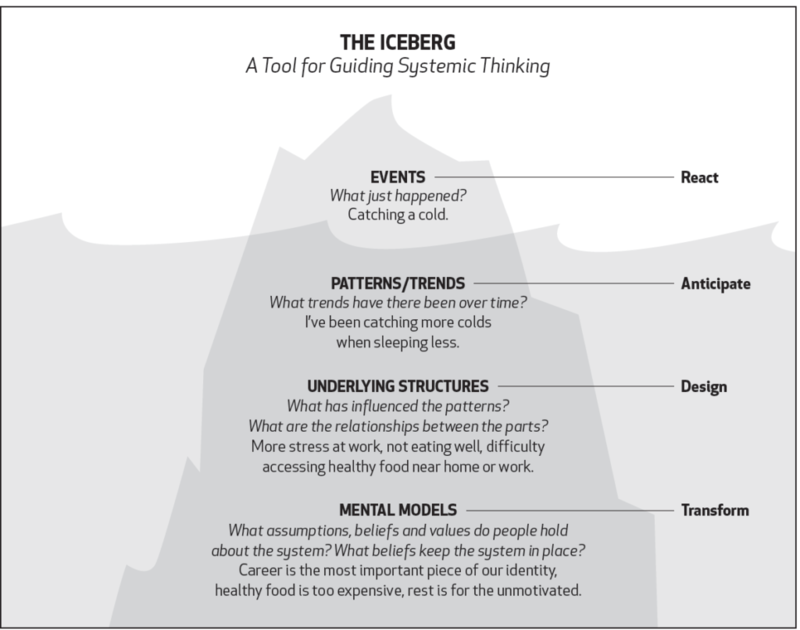 If given the opportunity to see the iceberg for what it is and the myriad forces that make it up, the theory of systems thinking tells us the public is more likely to recognize the big picture and, potentially, develop sustainable approaches that address the whole instead of just one piece. Of course, the idea of unpacking and explaining systemic problems isn’t foreign to journalists. Many, if not most, reporters and news outlets strive to reveal the complexity behind the stories they are covering, particularly through investigative and enterprise reporting. They are all about exploring the “iceberg” down to its base. We’re also seeing more newsrooms working to collaborate with and empower their communities on challenging topics in creative ways. By looking at problems through the lens of interconnected systems, journalists of all types can take a step back to examine the bigger picture, identify unique angles to pursue, and brainstorm creative ideas to get their reporting directly into affected communities. Our approach is geared to help support these practices. We think systems thinking can serve as a useful mindset for journalists to more fully understand and report on complex issues in ways that are practical, realistic, and threaded into their day-to-day reporting process. Recognizing the time and resource constraints that beleaguer today’s shrinking local newsrooms, we have developed a set of practical systems thinking tools that journalists can use — whether on a tight deadline or writing a longer, investigative piece — that will help them tell these important, difficult stories and work within their newsroom’s demands. At Journalism + Design, our goal is to integrate systems thinking into news organizations, classrooms, and communities to provide journalists with tools and approaches to tell complex stories. We want to help them work within their communities to unpack big problems and empower the public with relevant, actionable information. Through our “systems journalism” initiative, we want to explore different ways that local newsrooms can take a community-centered approach to complex problems in their area and use systems thinking to find new opportunities for reporting and collaboration. 1) This summer, we’re hosting workshops with newsrooms in North Carolina to explore how systems thinking can surface new ideas and collaborations for reporting on local gentrification. 2) We’re working with Renaissance Journalism and the Bay Area Media Collaborative to help local media partners apply systems thinking to their focus on the region’s housing crisis. 3) We’re also partnering with the Listening Post Collective, local media, and community stakeholders in Baltimore to identify a community-centered news and information project that we can design to investigate pressing local issues. The approach we bring isn’t meant to be one size fits all. Instead, we’re tailoring our engagements to the particular needs of our partners. We’re creating opportunities to introduce systems thinking to local news ecosystems: from introductory workshops to hands-on sessions with newsrooms and community members that explore concrete ways to examine specific problems. We believe that journalists and newsrooms should understand the role that they themselves play in systems. And journalists can certainly use their power and roles as information gatekeepers to equip community members with the context they need to make more informed decisions. A key assumption in our approach is the idea that news organizations can collaborate with their communities to spark positive social change. While this doesn’t necessarily mean advocating for specific policies or approaches, we do believe that journalists can be advocates for their communities. By employing systems thinking and human-centered design, journalists can better serve local information needs and illuminate ways to address our wicked problems. As E.J. Dionne of the Washington Post wrote in his 1996 book, They Only Look Dead: “With the country passing through a series of crises, journalism’s primary task ought to be to engage citizens in the quest for paths forward.” More than twenty years later, the crises remain, with fresh ones emerging all the time. We hope a systems-based approach will give journalists more tools to tackle them. Throughout the year, we’ll document our workshops and what we’re learning, and will offer resources for systems thinking that any journalist can apply in their newsroom. If you want to learn more about systems thinking and how we might collaborate, email Kayla Christopherson: christok@newschool.edu.